One of the best ways to see real estate is by foot in summer and in winter. I'll defend that statement: I'm a runner. As a pretty laid back marathoner, my goal is to run a couple a year with halves as tune ups. From my house in Montpelier, I can run right into Hubbard Park or up the hill to the dirt roads of Middlesex - there are plenty of options for training without getting in a car. Central Vermont's mountain bikers and avid skiers get more press, but the Central Vermont Runners are making an impact in the community. Most events attract a modest number of participants, but increasing turnout and enthusastic members make the CVR's activities reliably successful. At last week's annual Berlin Pond 5-miler, things were more heated. Some came straight from work to wind down from the day, others were ready to run a sub-30 race. This year, the crowd ranged from pre-teens to a spry couple of 70-somethings who turned out for the views, soft dirt roads and camaraderie. 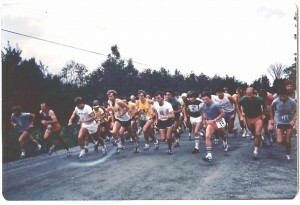 Tonight, I'm hoping to get out of the office on time to make CVR's Tuesday Night Fun Run on the Montpelier Recreation Path. You can choose your distance and your level of motivation -- its just a great opportunity to run with others. Join us at 5:30pm on Tuesdays. It's fun and it's free!